When my yoga teacher, Laura Josephy from Tahoe Yoga Shala, asked me if I’d be interested in drawing every pose in the Ashtanga Yoga Primary Series for her teacher training manual, I jumped at the opportunity. I love drawing the human figure. The challenge of making 75 studies felt like an extension of my own yoga practice and an opportunity to deepen my understanding of anatomy. What I hadn’t anticipated was the profound nature of the journey, both artistically and personally. I’m learning so much from the repetition and discipline required to work with this much consistency. The fine nature of the drawing style requires a level of concentration and absorption I haven’t experienced since I was an art student. I have a yoga anatomy book under my easel, along with David Swenson’s seminal Practice Manual for reference. Uniting other disciplines with art is not a new venture for me. I graduated from the University of the West of England in 1997, with a degree in Art and Visual Culture. The program was an experimental blend of studio art, philosophy, theology, politics and history. It suited me because I love ideas as much as I love making art. To me, they are inextricably linked. I’ve always had a very broad range of academic interests, and am not and expert at anything – I just have a childlike curiosity about things and find connections intriguing. This curiosity has led me to combine art with many different fields of study, such as science and cultural politics. I also use my art for social and political activism and founded the local group Tahoe Activist Artists in 2017. The imagery that manifests in my work is usually centered on the human form although I like to spend time outdoors, communing with nature. I fill sketchbooks with observations of landscape and nature, working out ideas and emotions with words and images combined. I first came to Ashtanga around 12 years ago, not long after I moved to Tahoe from Wales. My husband and I had met whilst bouldering our way around Canada and the US. I didn’t have my work visa yet, so I took a few classes at Lake Tahoe Community College for something to do and to connect with like-minded people. 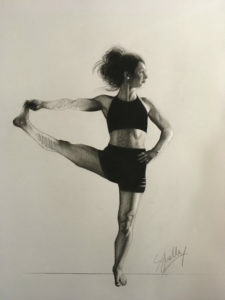 I took oil painting and figure drawing with Phyllis Shafer and Ashtanga with Amrito Cross. I was too committed to climbing to maintain a regular practice though, and soon ended my daily practice after the quarter was finished. I began practicing yoga again last October after I realized that I had to let go of climbing after 21 years. I was diagnosed with endometriosis and breast cancer in 2015, and the treatments, trauma and surgeries have changed my life. The transformative nature of the disease has presented me with what I call the ‘dark gift’. Meditation and a new spiritual practice brought me to the realization that I needed physical activity which nurtured my body and soul in a way that climbing no longer did. Ashtanga initially attracted me because it reminded me of a long, technical boulder problem. Visualization, memorization of sequence, and fine, meditative, detailed work balanced with the big movements or gestures are the qualities of bouldering and art that I love. I find this again in yoga, with a different language that translates to the same thing. When I can practice regularly, I feel at one with the world. The nature of Mysore style classes allows for a personal journey, supported by caring teachers. I feel part of a community again, and I also enjoy occasional Yin and flow classes. My body feels strong and supple, and I feel nurtured and empowered. The athletic nature of this practice satisfies my need to be physically energetic. The spiritual, meditative aspect of the practice calms my mind, makes me feel connected to the universe, and helps release the tension of my body. I’m profoundly grateful to have found the Shala, my teachers, and to have the opportunity to explore my practice in more depth through art. It makes me happy to know that the drawings will continue in their journey as a teaching tool, and find purpose in the education of a new generation of instructors.